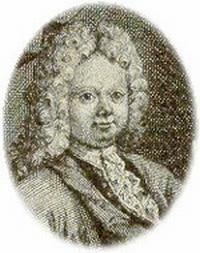 1669 Birth of Italian composer Alessandro MARCELLO in Venice. d-Padua, 19 JUN 1747. 1687 Funeral of English composer and chorus master at St. Paul's, Michael Wise, who was killed by a nightwatchman following a fight between Mr and Mrs Wise. b-Salisbury, c. 1647. 1733 (25th? )Death of French composer and choral instructor Jean-Baptiste Moreau in Paris. b-Angiers, 1656. 1746 FP of Jommelli: "Antigono" Lucca (1746). 1748 Handel finishes the score of his oratorio Susanna. 1787 Mozart finishes his A Major violin sonata, K 526. 1803 (July 24?) Birth of French opera composer Adolphe Charles ADAM, in Paris. d-Paris, 3 MAY 1856. 1804 Birth of Austrian flute virtuoso Josef FAHRBACK. d-1883. 1817 (28th? )Death of English soprano Anna Selina Storace. Created the role of Susanna in Mozart's The Marriage of Figaro in Vienna, 1784. b-London, 27 OCT 1765. 1824 FP HÉROLD: "Le Roi René" Paris (1824). 1826 Birth of German-American composer Edward MACK in Stuttgart, Germany. d-1882. 1829 Death of English conductor and organist Benjamin Jacob in London. b-London, 15 MAY 1778. 1837 Birth of French organist and composer F. C. Theodore DUBOIS in Rosnay. d-Paris, 11 JUN 1924. Operas, "La prova di un'opera seria" (1863); "La Guzla de l'émir" (Paris, 1873); "Le Pain bis, ou La Lilloise" (Paris, O-C, 1879); "Aben Hamet" (produced in Italian, Théàtre du Châtelet, 1884); "Xavièr" (Paris, O-C, 1895); "La fiancée d'Abydos" (np); "Le florentin" (np). 1839 Birth of Czech-Russian composer and conductor Eduard NAPRAVNIK in Byst. d-Petrograd, 23 NOV 1916. 1846 FP of Franz Von Suppé's operetta Dichter und Bauer 'Poet and Peasant', in Vienna. 1856 Birth of Austrian conductor, composer and arranger Felix MOTTL in Unter-St.Veit near Vienna. d-Munich, 2 JUL 1911. Started his studies at a seminary, then the Vienna Conservatory. Assistant at the Bayreuth (1876). He had a long intimate relationship with the soprano Zdenka Fassbender (m/s) (1879-1954) Ger., and was legalized in marriage on his deathbed. 1886 Birth of English soprano Dorothy Moulton, [Lady Mayer] in London. d. Henham, Essex , June 24, 1974. 1881 Birth of French soprano Marthe Chenal. d. Jan. 29, 1947. 1890 Birth of composer Franz Philipp. 1895 FP of PIERNÉ: "La Coupe enchantée" Royan (1895); rev. Paris, Dec. 26, 1905. 1907 FP of Dir Edward Elgar's Pomp and Circumstance March No. 4, in London. 1910 Birth of German-American composer Bernhard HEIDEN in Franfurt am Main. d-Bloomington, IN, 30 APR 2000. 1912 Birth of German tenor Lorenz Fehenberger, in Oberweidach. d. Munich, July 29, 1984. Studied singing in Munich. Début in Der Rosenkavalier, at the Graz opera (1939). 1941- 45, he sang at the Dresden State Opera. 1946- 77, he was a member of the ensemble of the Bavarian State Opera, Munich. Created the role of [Haemon] in Carl Orff's Antigonae, Salzburger Festspiele (1949), where also sang frequently in concert performances, 1949-67. Royal Opera House, CG, Teatro Colón (Buenos Aires), Maggio Fiorentino, Vienna State Opera, and at opera companies in Italy, Austria, Switzerland, Belgium, and the Netherlands. 1976, he appeared at the FP of Joseph Tal's, Die Versuchung, Munich, giving his final performance as [Wirt] Der Rosenkavalier (1977). 1919 Birth of Danish composer and pianist Niels Viggo BENTZON in Copenhagen. d-Copenhagen, 25 APR 2000. 1921 Birth of Italian soprano Mina Cravi-Bozza, in Bari. d. New York, Feb. 10, 1983. 1924 Birth of American pianist Louis TEICHER. (Ferrante and Teicher duo). 1932 (23rd? )Birth of Australian composer Richard MEALE in Sydney. 1934 Birth of American composer Roger DICKERSON. 1934 Rachmaninoff finishes his Rhapsody on a Theme of Paganini. 1943 FP of Leonard Bernstein's song-cycle I Hate Music! with mezzo-soprano Jennie Tourel and Bernstein, piano, at the Public Library in Lenox, MA. 1952 Birth of American organist Carlo CURLEY, in North Carolina. 1954 Birth of Venezuelan composer Alvaro CORDERO in Barquisimeto, Venezuela. 1968 Czech conductor and composer Rafael Kubelik appeals to world musicians to boycott performances in the five nations that invaded Czechoslovakia 20 & 21 AUG. It was supported by many including Claudio Arrau, Bernard Haitink, Otto Klemperer, Yehudi Menuhin, Arthur Rubinstein and Igor Stravinsky. 1973 Death of Czech composer Slava Vorlova in Prague. b-Nached, 15 MAR 1894. 1976 Death of English composer Michael (Dewar) Head in Cape Town, South Africa. b-Eastbourne, 28 JAN 1900. 1980 FP of W. Lutoslawski's Double Concerto, for oboe, harp and chamber orchestra, Heinz Holliger, oboe; Ursula Holliger, harp; and the Collegium Musicum conducted by Paul Sacherin Lucerne, Switzerland. 1985 Death of American composer Paul Creston in San Diego, CA. b-NYC, 10 OCT 1906. 1988 Death of English conductor and pianist Kenneth Leighton in Edinburgh. b-Wakefield, 21 OCT 1929.